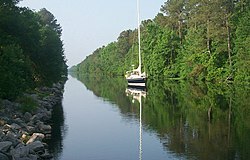 Chesapeake is a diverse city in which few urban areas as well as many square miles of protected farmland, forests, and wetlands, including a substantial portion of the Great Dismal Swamp. Extending all the way from the rural border with North Carolina to the harbor area of Hampton Roads adjacent to the cities of Norfolk and Portsmouth, Chesapeake is located on the Atlantic Intracoastal Waterway and has miles of waterfront industrial, commercial and residential property. Chesapeake made national headlines in 2003 when, under a court-ordered change of venue, the community hosted the first trial of convicted murderer Beltway sniper Lee Boyd Malvo for one of the 2002 terrorist-style attacks. A jury spared him a potential death sentence, choosing a sentence of “life in prison without parole” instead for the young man, who was 17 years old at the time of the crime spree. A jury in neighboring Virginia Beach sentenced his older partner John Allen Muhammad to death for another of the attacks. Chesapeake’s daily newspaper is the Virginian-Pilot. Other papers include the Port Folio Weekly, the New Journal and Guide, and the Hampton Roads Business Journal. Hampton Roads Magazine serves as a bi-monthly regional magazine for Chesapeake and the Hampton Roads area. Hampton Roads Times serves as an online magazine for all the Hampton Roads cities and counties. Chesapeake is served by a variety of radio stations on the AM and FM dials, with towers located around the Hampton Roads area. Chesapeake is also served by several television stations. The Hampton Roads designated market area (DMA) is the 42nd largest in the U.S. with 712,790 homes (0.64% of the total U.S.). The major network television affiliates are WTKR-TV 3 (CBS), WAVY 10 (NBC), WVEC-TV 13 (ABC), WGNT 27 (CW), WTVZ 33 (MyNetworkTV), WVBT 43 (Fox), and WPXV 49 (ION Television). The Public Broadcasting Service station is WHRO-TV 15. Chesapeake residents also can receive independent stations, such as WSKY broadcasting on channel 4 from the Outer Banks of North Carolina and WGBS-LD broadcasting on channel 11 from Hampton. Chesapeake is served by Cox Communications which provides LNC 5, a local 24-hour cable news television network. DirecTV and Dish Network are also popular as an alternative to cable television in Chesapeake. 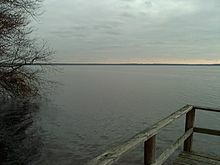 Chesapeake, Virginia, is the hometown of 4 x World Kickboxing Champion Bubba Blackhawk Walters who also attended Deep Creek High School. It is also the off-season residence of New York Mets’ third baseman David Wright, and the hometown of the Washington Redskins’ Pro Bowl cornerback DeAngelo Hall and Philadelphia Eagles defensive end Darryl Tapp. Like Walters, both Hall and Tapp graduated from Deep Creek High School. NASCAR driver Ricky Rudd was also raised there and went to Indian River High school, where former NBA superstar Alonzo Mourning also attended. Chris Richardson, a finalist on American Idol: Season 6 also resides in Chesapeake. Mike Scott who was a second round draft pick for the Atlanta Hawks in 2012 also calls Chesapeake home. He also attended Deep Creek High School. 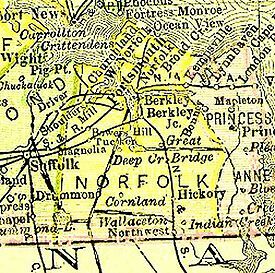 Chesapeake, Virginia, is also the hometown for the following baseball players: BJ Upton, center fielder; and his brother Justin Upton, right fielder, both playing for the Atlanta Braves; Michael Cuddyer of the Colorado Rockies; Scott Sizemore, second baseman for the Oakland Athletics; and Michael E. Mitchell, outfielder for the Asheville Tourists/Minor League “A” Team of the Colorado Rockies. BJ Upton graduated from Greenbrier Christian Academy. David Wright and Scott Sizemore are graduates of Hickory High School. Justin Upton, Michael Mitchell, and Michael Cuddyer are graduates of Great Bridge High School. The climate in this area is characterized by hot, humid summers and generally mild to cool winters. According to the Köppen Climate Classification system, Chesapeake has a humid subtropical climate, abbreviated “Cfa” on climate maps.